Everyday St. Rose staff provide exceptional care – in many cases saving and improving lives but also providing dignified, compassionate end of life care. In both cases, patients and their families are grateful and choose to support St. Rose by honoring their caregivers through the St. Rose Saints Grateful patient program. St. Rose Saints are special people who touch the lives of those they care for so deeply that they are inspired to support our mission. 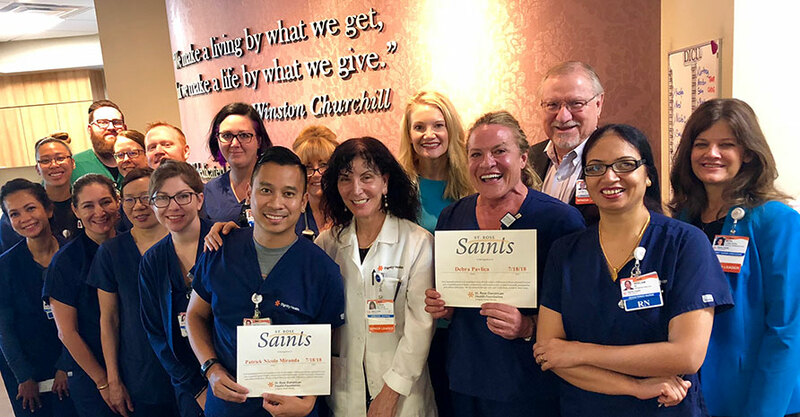 Registered nurses, Debra Pavlica and Patrick Miranda, who work in our Siena ICU Department were recently presented with a St. Rose Saint recognition. A grateful patient made a donation in their honor to thank them for the exceptional care they provided. Thank you Debra, Patrick and the entire team in ICU for all you do to spread humankindness to all of our patients each and every day! If you know a grateful patient or are grateful for care you have been personally provided and would like to learn how to make a gift in honor of your caregiver, please contact our Health Foundation at 702.616.5758.